The local bus operator won ‘Bus Operator of the Year’ at the recent 2013 National Transport Awards at the Westminster Park Plaza in London . As a result of the success Reading Buses has currently now won six of seven shortlistings in two different sets of leading industry awards. ‘The people making a real difference to transport across the UK ’ were recognised at the award ceremony which attracted more than 600 senior transport professionals including the Secretary of State for Transport Patrick McLoughlin MP. In voting Reading Buses ‘Bus Operator of the Year,’ the judges concluded that passenger and revenue growth was underpinned by solid performance improvements. The company improved customer satisfaction through a number of different initiatives to show that there was a real focus on putting the customer first. There was a significant focus on improving staff morale, skills training, vehicle cleanliness and investment in new technology as well as improved on-board information displays. Reading Buses was also proud of the increase in women bus drivers which meant that 11% of their total driving staff are now female. 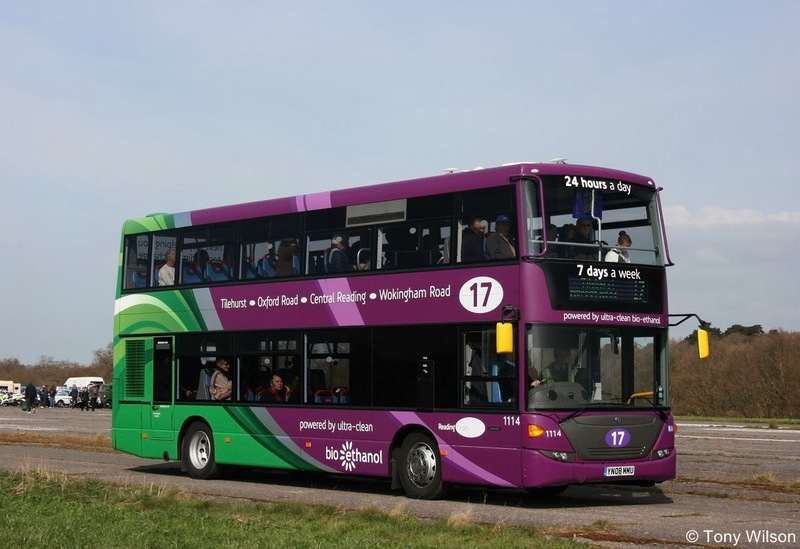 Reading Buses last year developed its biggest route, purple 17, by improving Monday to Saturday frequency resulting in week-by-week patronage growth of up to 20% - with further improvements to Sunday services already in place this year. The company also points to 25% growth in the ‘greenwave’ service revamped in partnership with Reading Borough Council, a 17% increase in travel by young people under the Solo initiative to bring no-fuss cheaper travel to under-19s, the introduction of the fully automated online top-up for their simplyBus smartcards, and more interaction with their customers online through their website and social media feeds. In achieving its ‘Dedication to access for all’ award, Reading Buses demonstrated their true commitment to accessibility by improving elements across its fleet for all customers. They have a fleet which has been 100% low floor for some time – four years ahead of the DDA’s requirement. Bus destination displays have been made bigger and more legible, individual brightly coloured branding for different routes help people recognise their bus and audio and visual next stop announcements have already been introduced on over half the fleet. Reading Buses was one of the first bus companies in the UK to offer reduced rate travel for job seekers, the Solo initiative has helped to get more young people on the bus and the online top-up facility has also seen more customers switch to easier, and cheaper, smartcard fares. The company say they were ‘astounded’ by the results which reflected the hard work put in by all staff in the organisation. Said James Freeman, Reading Buses Chief Executive Officer: “We have worked extremely hard over the last four years to get to where we are now. We have shifted the focus more towards the customer and what we can do to enable them to go about their lives – whether by improving their daily commute or giving them cheaper fares in the evening to encourage them to get the bus into town. “We recognise that we are still on a journey and that we have more improvements to make, but it does show how a few good ideas implemented by fantastic staff can transform an entire organisation,” he added.